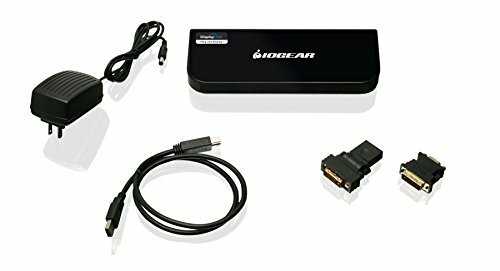 IOGEAR'S USB 3.0 Universal Docking Station quickly and easily transforms your laptop, Ultrabook or Microsoft Surface Pro tablet into a full-featured workstation. This universal dock is an all-in-one solution to the latest port-deficient laptops and tablets. It allows you to connect as many as 10 devices to your laptop through a single high speed USB 3.0 cable that offers speeds up to ten times faster than the previous USB 2.0 standard. With support for dual monitors, Gigabit Ethernet, 6 USB ports, plus microphone and speaker connections, the USB 3.0 Universal Docking Station connects you to all your peripherals so that you can completely mobilize your customized home office. It also comes with its own power adapter so that you can connect and power all your USB devices without a worry. Ultra-portable tablets are ideal when you’re on the go but their performance is restricted due to their limited connectivity. With the power of IOGEAR’s USB 3.0 Docking Station and Windows 8.1 Pro, tablets are now ready to replace your home PC. When it’s time to go from leisure time to work time, just plug your Windows 8.1 Pro enabled tablet into the IOGEAR USB 3.0 Docking Station and it becomes your full-blown work center! Now you have a complete home office suitable for nearly any task. Add 2 external displays to your workstation for a total of three screens! With dual monitor outputs you can edit video on one screen, compose the soundtrack on another screen, plus monitor email on your laptop screen all at the same time! "